George Smart (1845-1862) was born in Andover to Hugh and Jane Smart, who had emigrated from Scotland just three years before. Hugh Smart was a flax dresser at Andover’s Smith & Dove mill, and his sons were on track to follow him into the mills. In 1860, fourteen-year-old George was working as an apprentice machinist. 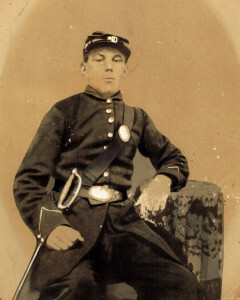 He left Andover in the spring of 1861, as Company H’s drummer, along with brother-in-law Milton B. Townsend and brother Alexander, a sergeant in Amesbury’s Company E. With the rest of the company, he was assigned to garrison duty outside of Washington, DC, but fell seriously ill before the regiment had seen any serious action. Hugh Smart, notified that his son was gravely ill, traveled to Ft. Albany, but George succumbed on July 7, 1862, probably to the effects of malaria, which affected many in the company. Hugh Smart brought his son’s remains home to Andover for burial at South Church cemetery.